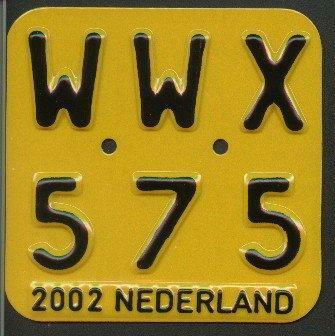 Jacco Hoekstra submitted this picture of the new permanent moped plates introduced 1 September 2005. They started off from 01DBB1. 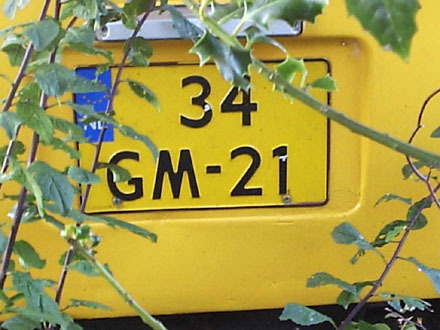 Yellow plates = Mopeds with 49 cc engine, speed max 45 km/h (Bromfiets). 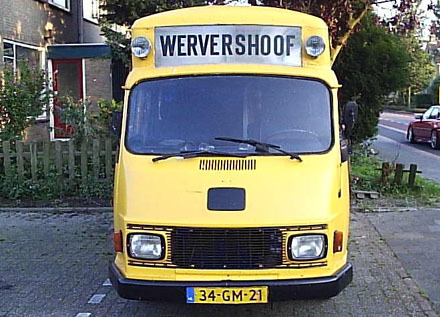 Arnout Mekkering submitted the next pictures. They show an error plate where the M on the rear plate is actually a W upside down. The plate is from the normal series 1973-78 remade in 2000 onwards plate style. The rest of the photos on this page were submitted by Jacco Hoekstra. The first three are of plates from his car. They are from July 2001. His normal yellow plate was lost. He then first received a white 30-day temporary replacement plate with the same registration. 07 = Valid in July. The red tape is a private addition by Mr Hoekstra himself. After that he received this new plate, recognizable as a replacement plate by the number 1 above the first hyphen. 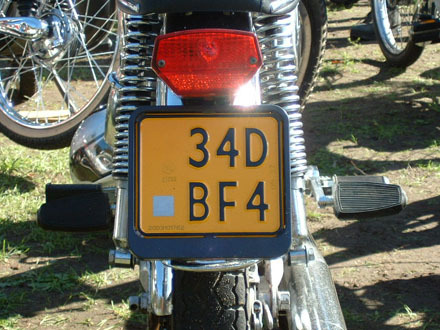 This is the 2002 moped plate. 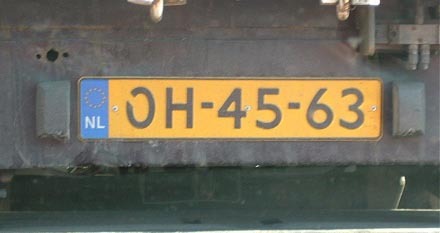 This is an old trailer registration remade in the new plate style. Photo taken in 2003.